Let’s just toss all notions of continuity out the window for a moment, shall we? That seems to be the necessary starting point if one is to enjoy the not-inconsiderable charms of this latest re-jiggering of the relationship backstory of Homer J. Simpson and Marge Bouvier. Credited to legendary sitcom writing team Tom Gammill and Max Pross, “3 Scenes Plus A Tag From A Marriage” might only be one of a handful the pair are credited with writing, but they’ve been on board The Simpsons’ ship for a long, long time. That familiarity works to pepper this episode with more than a handful of decent gags that stand on their own, regardless of whatever quibbling is left to be done over the show’s timeline at this point. But it also carries a whiff of self-referential self-amusement that makes the episode feel inessential. Watching two old pros punch a clock makes for some solid laughs, but it’s still not the place for groundbreaking Simpsons comedy. But it’s in the meat of the episode where the mere cleverness of the enterprise works against it most. Regaling the hip young couple occupying their old apartment with the story of their pre-Bart carefree life of roller rinks, desert meteor-watching, and bagels instead of donuts, Marge and Homer spin a tale whose greatest sin isn’t screwing around with continuity, but treating that retcon with breezy disposability. Again, along the way, there are some very funny bits. Hellion baby Bart luring the marginally less-pathetic young Kirk Van Houten into a toothpick, citrus juice, and salt high-five trap is executed with laugh-out-loud professionalism and an ear for specific absurdity. “Sea salt? !” cries the smarting Kirk, “That has the biggest crystals of all!” And guest stars Kevin Pollak (pulling triple duty, but mainly as younger Homer’s enthusiastic boss), and J.K. Simmons (rattling off his J. Jonah Jameson shtick as Marge’s editor at The Springfield Shopper) are both inherently funny guys. Simmons, after the harried Marge brings back a story about Bart wrecking the art show of other guest voice, artist John Baldessari, bellows, “This is dynamite!” Then, to Marge’s momentary delight, he corrects, “Dynamite is dangerous!” before canning her. 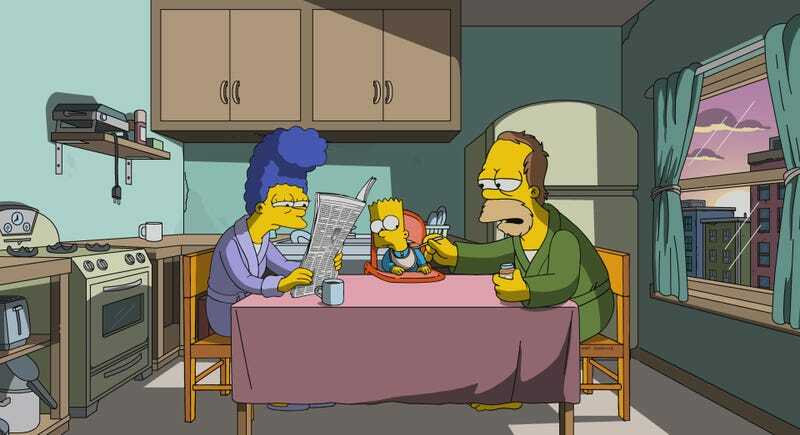 The Simpsons has mined the characters’ backstories for plenty of episodes. Some of those have been indifferent joke machines that either violate the personalities of the characters, or their established histories, or both. But some have been true classics, finding the sweet spot of adding new details to the Simpsons’ family dynamic while remaining genuinely funny in their own right. Here, Gammill and Pross find a pleasantly expendable middle ground. There’s nothing resembling the sweetness of, say, “Lisa’s First Word,” which similarly delved into how parenthood and sibling-hood changed the lives of each member of the family. Instead, the whole story is used to mess with—and then restore—the ferret-owning bliss of the hipster couple (who we don’t care about), all the while undeniably mucking about with the past in ways that are merely sort of cute. Lots of changed hairstyles. (Has Hibbert ever been decked out like Prince before? I can’t recall.) Everyone’s trimmer, Moe is a roller-skating fiddle-whiz, and we find out that Kent Brockman (apparently after having changed his name from Kenny Brockelstein) is dangerously protective of his “soft news” beat, for which he’s won the Human Society’s Golden Pig Ear award for animal-related puff pieces. But Gammill and Pross take the emotional beats of the story about as seriously as they do the continuity. The fact that Homer and Marge were barely out of high school when Marge got accidentally pregnant is so central to the emotional core of these characters and their existence that to chuck it out solely in order to toss a few gags at young, hip Springfield seems irresponsible to anyone who still cares about such things. These are pretty funny people, but they’re not the Simpsons, at least not the Simpsons we’ve been invested in for all these years. When Marge tells Homer blissfully during the flashback to their carefree days, “Oh Homey, this is the happiest I have even been in my life,” it’s so distant from the trapped-in-their-current-life Marge and Homer that it evaporates in the desert air where they cuddle under the stars. The Marge-Homer dynamic has always derived much of its pathos from the very real sense that there might not have been a Homer and Marge if not for Homer accidentally knocking Marge Bouvier up. 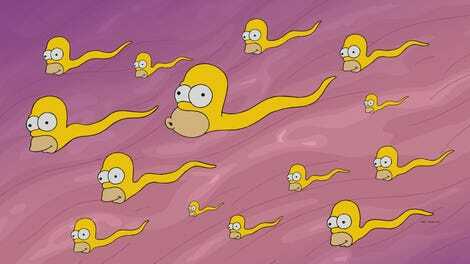 (Here again, we get an extended “Homer’s heedlessly enthusiastic sperm” gag.) In making the best of a situation neither intended, the pair have developed into a deeply imperfect but thoroughly human couple. But, once more, I don’t know who these impostors are. After they emerge from their self-obsessed rehashing to find that the female half of their audience has split in disgusted terror at the prospect of her own burdensome parenthood, Homer and Marge order their own burdens/children to paste on fake smiles and assure the fleeing woman that they’re really quite happy with how things turned out. Homer, cajoling the reluctant Lisa into participating in the charade, explains, “The only way humanity survives is if we perpetuate this lie!” But there’s no sense that he or the rest of the family give a damn about these people or their relationship, let alone the future of the human race, so there’s no payoff, even to this glibly unnecessary exercise in rewritten history. As they drive off, the kids ask why they didn’t tell any of the other Simpsons origin stories (like that of their oft-replaced cats), and Homer snaps, irritatedly, “Nobody cares.” Also irritating is an episode whose audience is determined to care more about it than those writing it. The couch gag was another bizarrely brilliant bit from guest animator Bill Plympton. Here, Homer—rendered in Plympton’s signature sketchy style—sings a lovely song about finding just the right person to love while his face stretches, shifts, turns inside-out, and generally tortures itself in counterpoint to the lyrics’ rosy picture of romance. It’s a Simpsons-ized adaptation of Plympton’s Oscar-nominated short Your Face, and, with a heartfelt, understated, and emotionally sincere singing performance by Dan Castellaneta, the finale—with Homer’s mangled visage gradually coming to rest as an image of his family together on their sofa—is a much more faithful and satisfying depiction of the heart of The Simpsons than the episode that follows. Let us never talk about why Jasper’s sperm is in among Abe’s. Also, why do we need a Grandpa’s sperm joke? The headline “Terrible Enfant Shocks Art World” is outstanding, though. What the hell was Bill Plympton thinking with Hitler’s Folly?